Dan Sneed invites you to go with him on a journey of discovery to find the real 'you' in Christ. To find the 'you' that God intended from the beginning. The 'you' that through Jesus Christ you have already become. - Publisher This practical study on God's intention for His creation explains that we are created in God's image but broken by sin, and looks at the resultant struggles and how man's God- given identity is restored in Chirst. Sneed talks about the possibility of a new self-image--and says that how we see ourselves has much to do with our lives on this earth. How we see ourselves also determines much of our lives of victory, how we face the enemy and how we touch a desperately needy world. 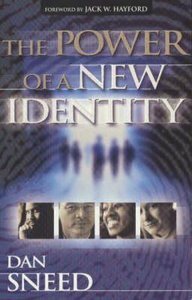 About "The Power of a New Identity"
This practical study on God's intention for His creation explains that we are created in God's image but broken by sin, and looks at the resultant struggles and how man's God- given identity is restored in Chirst. Sneed talks about the possibility of a new self-image--and says that how we see ourselves has much to do with our lives on this earth. How we see ourselves also determines much of our lives of victory, how we face the enemy and how we touch a desperately needy world.